Need a tropical escape? Fly down to the pool in your Michael Phelps Oasis Men’s Jammer! Part of Michael Phelps’ Palm Spirit Collection, this midnight black look features an accent panel wrapped around the legs and at the back of the waist. This bold accent features a lush tropical garden in vibrant shades of turquoise, lemon, jade, and tangerine. With a sunshine yellow Michael Phelps logo above the knee, this look will transport you to a desert island! 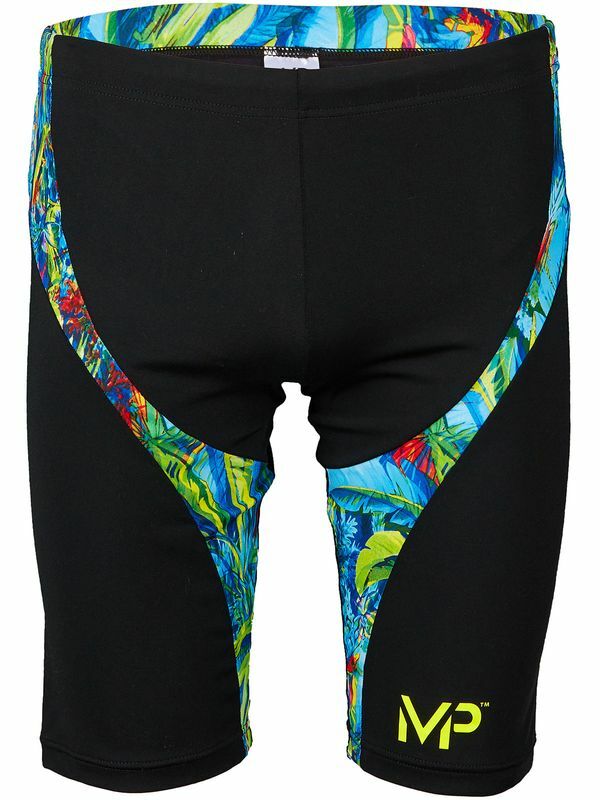 Personally designed by Olympic superstar Michael Phelps and Coach Bob Bowman, these jammers have everything that you need to get to the top! Aqua Sphere, the premier swimming equipment manufacturer for fitness and recreational swimming, aquatic exercise, and triathlons, and Michael Phelps, the most decorated swimmer of all-time, have together launched the “MP” brand. Combining Aqua Sphere’s global product design expertise and distribution with Phelps’ experiences at the highest levels of swim performance, the MP brand features a line of technical swim products featuring proprietary technologies and performance enhancing designs for competitive swimmers.